Tried to meditate but found it hard to settle down? Wanted to learn meditation but put it off because you've heard it's difficult? Already enjoyed meditation but wish you could go deeper? If you answered yes to any of these, then this online meditation course can help. For many of you, it might sound strange to hear that meditation should be effortless. If anything, you probably feel you’re not trying hard enough. But the opposite is actually true. Meditation works best when there’s no trying or effort. It’s about allowing the mind to relax. While trying harder may help in many day-to-day tasks, when it comes to meditation, the harder we try, the more tense our minds become. And this defeats the entire purpose of meditation. Once you stop all effort and striving, you’ll find the mind settles down naturally into a state of quiet. That’s where How To Meditate Without Even Trying comes in. This audio course will guide you through ways to manage disruptive thoughts and distractions. You’ll also discover how to release tension and let the mind fully relax. Getting the benefits of meditation doesn’t require great mental discipline or years of practice. It’s ideal for anyone. Whether you’re just getting started or have already tried it but want to go deeper, this course will show you how. Simple methods to settle your mind into a natural state of ease and contentment. These practices will help you stay present long after the lesson is over. Techniques that allow you to let go of physical and mental tension. This strain-relieving part of the program will also help you reduce stress outside of meditation. Advanced practices that allow your inner wisdom to guide you in meditation, and help you let go all resistance. These skills will help you reach deep states of meditation in only a few weeks. 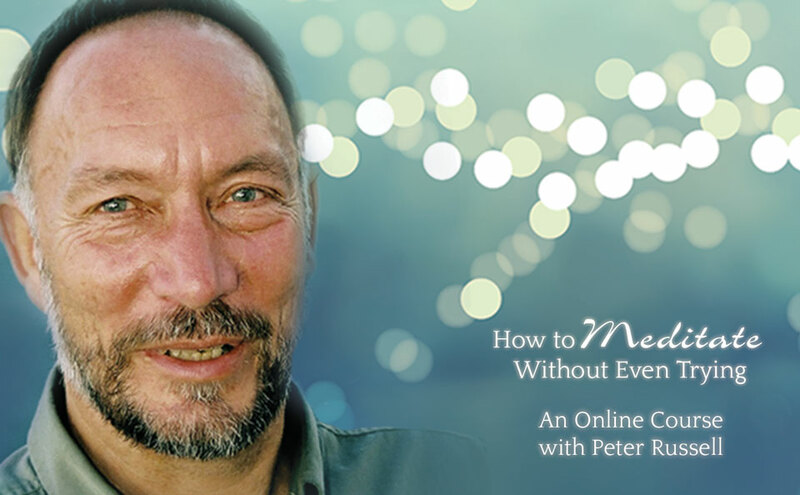 The course will take you from basic practices of being present to some of the advanced techniques that Peter has been teaching his students in recent years. This is the first time these new techniques are being made more widely available. They are very simple to apply, but profoundly effective. When you sign up for the course, you will receive the lessons in five installments. You’ll receive the first lesson immediately upon enrolling. Subsequent lessons will be sent to you once a week. This gives you the opportunity to become familiar with each technique and to practice it before moving on to more advanced skills. After completing the course you will have access to archives of all the lessons. Why is the course for both beginners and advanced meditators? The first lesson teaches a basic technique of becoming more aware of the present moment, that complete beginners will find easy to practice. Subsequent lessons build on this, introducing more advanced skills developed by Peter in recent years, which encourage complete effortlessness and letting go. He has been teaching these skills to experienced meditators, who have been delighted with the impact they have had on their practice. Each lesson consists of a short introduction of between 5 and 10 minutes, followed by a guided meditation of about 20 minutes. To get maximum value from the course you are encouraged to practice the meditation each day. New lessons will be sent to you once a week. Can I download the lessons to my iPod (etc)? Yes. You will need first to download them to your computer. There is a link on each lesson for that. Then copy it to iTunes and it should sync to your iPod (depending on how you have it set up). I do not have a PayPal account. PayPal accepts all major credit cards, e-checks, and other forms of payment. I enrolled but have not received any lessons. What amazed me most was how simple and clear are the techniques that Peter teaches. Thank you for a great course. You don't know how much it meant to me. I am just overflowing with gratitude for this course. Each lesson had something that spoke to a special need of mine. This course was absolutely amazing! Thank you, thank you. Your program is fantastic for beginners. You helped me understand that my wandering mind was not a sign of failure. This course was life changing for me. I will definitely recommend this course to others! Peter Russell is an author and public speaker, who is recognized as one of the leading thinkers on consciousness and contemporary spirituality. His books include The Awakening Earth, Waking Up in Time, and From Science to God, and his video The Global Brain won international acclaim. Peter believes that the critical challenge today is to free human thinking from the limited beliefs and attitudes that lie behind so many of our problems—personal, social, and global. His mission is to distill the essential wisdom on human consciousness found in the world’s various spiritual traditions, and to disseminate their teachings on self-liberation in contemporary and compelling ways. To this end he has been refining his practice of meditation and teaching it to others for more than forty years. His approach emphasizes complete effortlessness in meditation—a letting go of any expectation or control. The beauty of this approach is that nothing needs to be changed or eliminated. It is simply surrendering to the fullness of the present moment.